There are different models of these triggers to fit Mauser models 98FN, 98K, 95 and 96, 91-94, and 91-94K... For example, the Swedish Mausers were M96. Be sure to pick the right one for your Mauser. Remember that even "drop-in" fitted triggers, may still require some stock inletting Illustrated Instructions are included. I installation on a custom Mexican Mauser (M1936) action required a bit of wood removal for clearance. But the wood removed didn't absorb recoil and was accomplished with a simple round wood rasp taking only a few minutes. The trigger, like all my Timneys, is short, crisp and unvarying. I have a 8mm Yugo Mauser in its military configuration. I modified the rifle to make it usable, but easily brought back to original. Slip on recoil pad reduced my flinching. LER scope foe my old eyes. Installing a Timney trigger is one of the best improvements I have made. Stock inletting was easy with a Dremel tool and confined to the interior of the stock. The inletting is not visible on the exterior of the rifle. 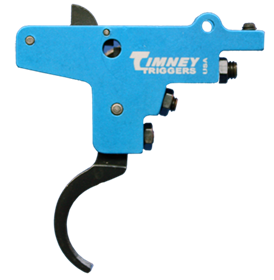 The Timney trigger was super crisp and perfect weight right from the package. The improvement in the trigger tightened up my target groups and made the military looking gun fun to shoot. The trigger is perfect and I can't imagine any improvements. Great product! Works very well. I did have to make the trigger slot longer but it said in the directions that I may have to. Nice product! I have as of yet, used triggers for the m96 or the 91/30 . These are for future builds. Sportsman adjusts from 2-4 lbs. Fully adjustable for take-up and over travel.